The global natural sweeteners market is demonstrating an intensely competitive business landscape owing to the presence of a large number of players, states a new report by Transparency Market Research (TMR). Some of the key players in this market are Tate & Lyle, Niutang Chemical Ltd., MacAndrews & Forbes, Cargill, Ajinomoto Co., DuPont, Symrise AG, Nestlé S.A., Archer Daniels Midland Co., Wilmar International Ltd., American Sugar Refining Inc., Associated British Foods, Ingredion Inc., and Roquette Frères. The level of rivalry between these players is significantly high and is expected to continue to increase in the years to come, notes the market study. According to the research report, the global natural sweeteners market is witnessing a considerable rise. The natural sweeteners market is anticipated to rise at a CAGR of 4.5% during the period from 2017 to 2026 and reach beyond US$ 39 Bn by the end of the forecast period. Low intensity sweeteners and high intensity sweeteners are the two main products available in the global market for natural sweeteners. Among the two, the demand for high intensity sweeteners is relatively high and the trend is likely to remain so over the next few years, states the research report. In terms of the geography, the global natural sweeteners market has been segmented into North America, Asia Pacific excluding Japan, Latin America, Japan, the Middle East and Africa, and Europe in this research study. Among these, the Asia Pacific excluding Japan market has acquired the dominance, owing to the high demand for various Asian food, such as flavored pastes, pickles, and sauces. This regional market is anticipated to remain on the top over the next few years. North America and Europe are also expected to witness a significant rise in the years to come, states the research report. “The global natural sweeteners market is driven significantly by the rising concerns among consumers pertaining to obesity and overall health and fitness,” says a TMR analyst. 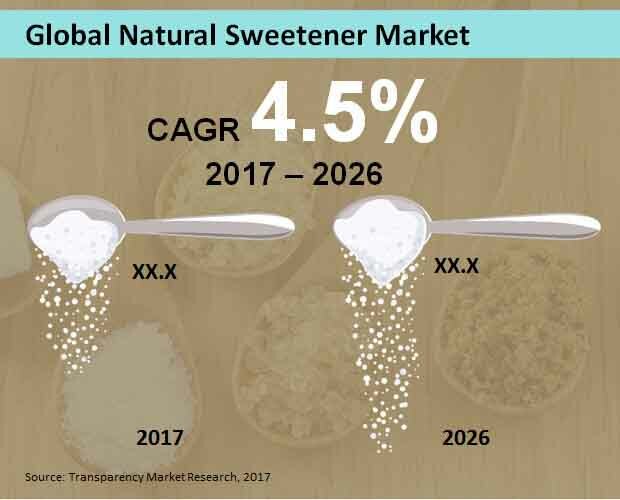 The increasing prevalence of diabetes among people across the world is also fueling the demand for natural sweeteners, reflecting positively on the growth of this market. In the coming years, innovations by vendors are likely to boost this market significantly, reports the market study.